With mid-July now approaching, Texas is moving toward what is traditionally the hottest part of the summer. However, hotter than usual temperatures have already blanketed the state for much of late spring and early summer, which has definitely had an impact on the drought levels we are currently experiencing, and has also enhanced wildfire dangers. The goal of the Stage 1 Drought Watch is to encourage the voluntary reduction of water use by at least 5 percent and to make people aware of worsening drought conditions. The United States Drought Monitor for July 5 notes that 82.62 of the state is experiencing conditions ranging from abnormally dry to exceptional drought. That exceptional drought – the worst status in the classification, was so far limited to 0.46 percent of the state – an area in southwestern Texas along the border with Mexico. However, an additional 6.84 percent of the state, including portions of the Brazos River basin in the state’s Panhandle, was suffering from extreme drought conditions. A total of just over 24 percent of Texas was classified as being in a severe drought, with an additional 55.3 percent of the state experiencing moderate drought. Wildfire dangers greatly increase as a consequence of the drought. A major wildfire that erupted the first week of July in Palo Pinto County had scorched about 3,200 acres. A smaller fire burned about 200 acres in Hood County. That fire damaged one structure before being contained. The fire had reportedly started near Highway 377 in Granbury and then spread north. A major impact of the drought is an increase in the number of counties in the state that are prohibiting outside burning. As of July 6, a total of 138 Texas counties had issued burn bans, including several in the Brazos basin. 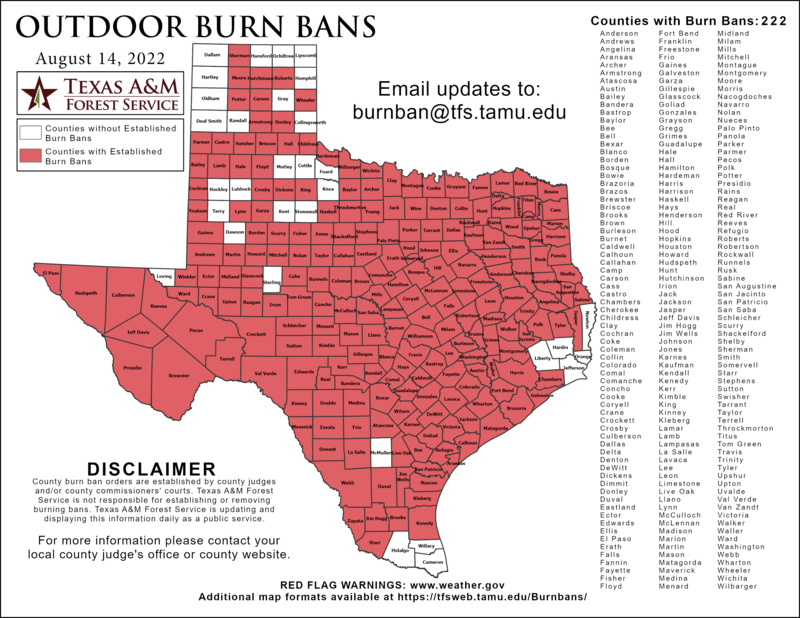 A complete list of Texas burn bans can be found here. One way to help protect your property from wildfire threats is by firescaping your home. Tips on how to do this can be found here. Unfortunately, forecasters expect drought conditions to linger for a while. Because the ground is parched, any rainfall received has not been enough to offset the drought. Brad Rippey, a meteorologist with the U.S. Department of Agriculture said the lack of moisture, combined with sustained high temperatures, means the drought will probably not be alleviated anytime soon. It isn’t only Texas that is suffering from the dry weather.